Supported by different projects (BIOCOM, BIOCHANGE, EPES and INTERCAMBIO), and in collaboration with several researchers belonging to URJC and other Spanish and foreign institutions, we are using observational and experimental approaches to evaluate how global change affects the structure and function of dryland ecosystems. 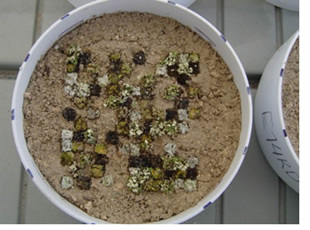 Such studies are being performed in several dryland ecosystems at different spatial scales, by using vascular plants, lichens and microorganisms as target organisms, thus allowing wider generalizations of the observed responses. In the framework of the BIOCOM Project, we are evaluating whether biotic community attributes modulate the response of dryland ecosystems to the ongoing global environmental change. To achieve this aim, we are using observational, experimental and modeling approaches. 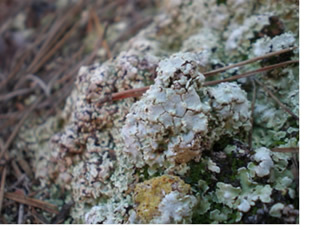 Such studies are being performed in different dryland ecosystems types at different spatial scales, by using vascular plants, lichens and microbiota as studied organisms. This research line has started in 2010. 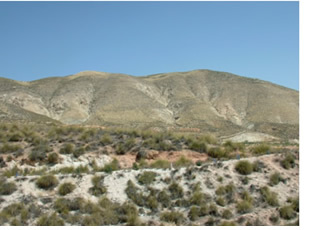 In the framework of the CEFEMED and INTERCAMBIO projects, we are assessing the role of vegetation structure on the onset of desertification process, and developing new early-warning signals of desertification, in order to establish effective management and restoration actions before ecosystem degradation becomes irreversible. We have specifically focused on studying the consequences of shrub encroachment for the maintenance of structure and function of semiarid grasslands dominated by Stipa tenacissima, and on evaluating the spatial pattern of perennial vegetation as indicator of desertification processes. The results obtained to date show that the presence of shrubs is clearly positive for Stipa tenacissima grasslands, since shrubs increase of vascular plant, microbial and lichen diversity, and improve soil variables related to nutrient cycling. A good part of my PhD. 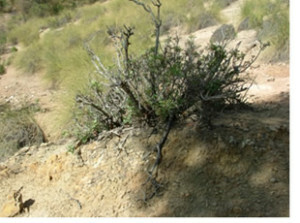 research has been devoted to evaluate the effect of the tussock grass Stipa tenacissima on the establishment of seedlings of woody species (Medicago arborea, Quercus coccifera, Pistacia lentiscus), and to study the mechanisms underlying this effect and its spatio-temporal dynamics on a gradient of abiotic stress in semi-arid Mediterranean steppes. The results of this research show that S. tenacissima facilitates the establishment of woody seedlings, and that this effect increases with increasing abiotic stress. 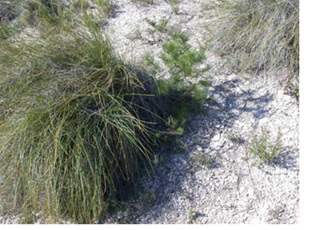 This interaction has a great interest, since it is the first documented case of facilitation of woody species by a perennial grass species in semi-arid areas. In collaboration with colleagues from the University of Alicante, I evaluated the interactions between the planted pines and both adult and seedlings of native shrub species. We found that the pines did not facilitate the establishment of seedlings of these species in dry years, but did it on wet years. 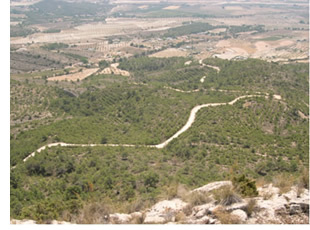 We found that this effect was mediated by the competition between the seedlings and the herbaceous understorey existing underneath the canopy of the pines, suggesting that an indirect interaction between the pines and the shrub seedlings, mediated by the herbaceous understorey, is taking place in semi-arid plantations. The results of these studies have important management implications, and contribute to the debate on the appropriateness of the use of monospecific Pinus halepensis to restore semi-arid degraded areas in the way that it has been traditionally used. Our current research on plant-plant interactions focuses on: i) evaluating their outcome along abiotic stress gradients at different spatio-temporal scales, ii) assessing ontogenetic shifts on the outcome of interactions between shrubs and herbaceous species, and iii) exploring the role of biotic interactions at the community level on the maintenance of the structure and functioning of dryland ecosystems. During the last years we have started a new research line devoted to evaluate community-level interactions between mosses and lichens assembling biological soil crust. We aim to study facilitative and competitive interactions along multiple abiotic stress gradients, and to evaluate their role as drivers of ecosystem structure and functioning. This work is providing new insights on poorly-known aspects on the ecology of this key group of organisms. 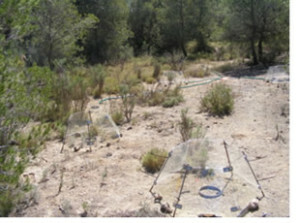 We are conducting several experiments and observational studies to evaluate the effects of biological soil crust (BSC) on the water, carbon and nutrient cycles in semiarid ecosystems, as well as to explore the role that particular attributes of BSC communities (i.e., spatial pattern, diversity, cover and evenness) on ecosystem functioning. During my PhD thesis, I took part in different projects aiming to evaluate the effects of soil heterogeneity on shrub establishment and development in semiarid areas at different spatial scales. In one of my favorite PhD. 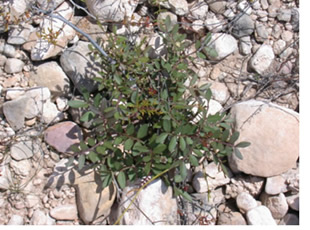 experiments, I quantified the spatio-temporal patterns of seedling survival of the shrub Pistacia lentiscus on a small (100 m x 28 m) semiarid degraded site in Southeastern Spain, using a combination of Spatial Analysis by Distance Indices (SADIE) and principal components analysis. These analyses revealed that seedlings did not die at random, and that the spatial pattern of mortality became quite constant once defined during the first summer in the field. I related these patterns to the spatial pattern of different soil properties, and I found that the small-scale spatial patterns of soil surface properties like sand content, resistance to penetration and bare soil cover were crucial to define the spatial patterns of seedling survival. During my post-doc stay at Duke I conducted a series of Phytotron experiments to evaluate if soil nutrient heterogeneity interacts with global change drivers (atmospheric concentration of CO2, nutrient availability, diversity and soil fauna) to determine the performance of individuals and assemblages in model grassland communities. 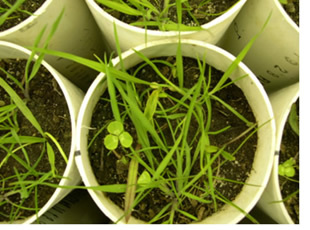 The results of these experiments have shown that nutrient heterogeneity interacts with several global change drivers to determine key biomass and nutrient responses in model grassland communities, suggesting that that single-factor studies could not be used to generate estimates on assemblage responses to combined changes in nutrient heterogeneity and global change drivers. We are currently continuing this line of research by performing several common garden experiments aiming to evaluate how soil heterogeneity modulates ecosystem responses to changes on the identity and richness of plant functional groups. 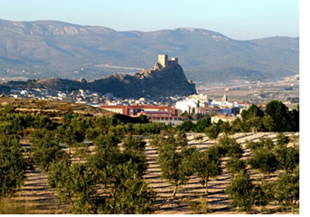 Within this research line, our work has focused on calibrating the LFA methodology (Landscape Function Analysis) developed by David Tongway (CSIRO, Australia) for its use in Spanish Stipa tenacissima. 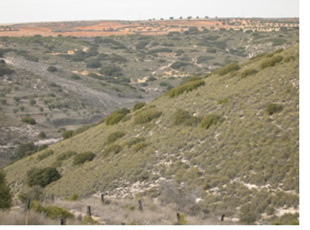 The results obtained suggest that the LFA methodology is suitable to characterize the functional status of semiarid Stipa tenacissima grasslands, and have also provided invaluable information on the importance of biotic factors, vegetation characteristic and impacts derived from past human activities as key factors influencing biodiversity and functioning in these environments. We are also using remote sensing tools to calibrate the LFA methodology, allowing its application over large areas of land, and testing this methodology in arid and semi-arid ecosystems from different Latin American countries. 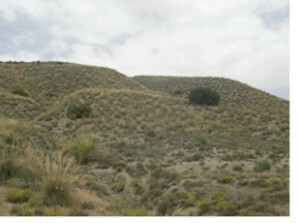 In addition to our work on the use of facilitation as tool for restoration, mentioned above, we have carried out different experiments and observational studies to evaluate the role of different treatments (i.e., hydroseeding, watering and fertilization) in restoration of semiarid motorway slopes, and to study soil and vegetation changes along a chronosequence of restored motorway slopes. My experience so far with invasive species has been very limited, but it is a topic quite interesting to me. During my stay in the University of Montana I worked with Kurt Reinhart and Ragan Callaway on the mechanisms underlying the invasion of Norway maple (Acer platanoides) in riparian and forest areas of the northern Rocky Mountains. We found that conspecific adults facilitated the establishment of the seedlings from this species by acting as “ecosystem engineers”, making soil conditions and microclimate more favorable for the establishment of seedlings. 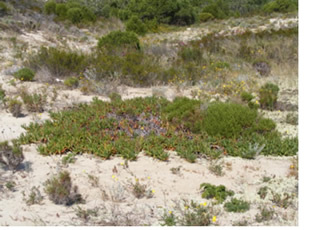 I am currently collaborating with researchers in Portugal who are evaluating the effects of the invasive speciesCarpobrotus edulis on the structure and functioning of sand dune ecosystems. My work so far have on this topic has been centred on the application of novel methods of spatial analysis to ecological data. These include the application of multivariate geostatistical approaches and approaches based on the cumulative distribution of patch boundary spacings to analyze the spatial pattern of semi-arid plant communities. I have also extensively used the Spatial Analysis by Distance Indices (SADIE) method to analyze the spatial pattern of soil properties and plants, and to explore the spatio-temporal dynamics of the survival of woody seedlings in semi-arid areas. The latter method, recently developed by Joe Perry at Rothamsted Research, is one of my favourites, and due to its features (facility of use, lack of complex mathematical background and thorough and useful output) has a great potential for the analysis of ecological data. I have coordinated for three years the ECESPA working group, developed within the Spanish Society of Terrestrial Ecology, and devoted to the promotion of the use of statistical techniques to analyze spatially explicit data in Ecology. As an undergraduate I devoted most of my early research to characterize the ecological characteristics and main environmental problems of the town were I was born (Sax). My main motivation to study the environment of my town was to contribute to fill the important gaps in the knowledge of its natural history existing when I began my University studies. I centered most part of the practical works that I did during my degree (in subjects such as Botany, Mycology, Zoology and Phytosociology) in Sax, and this provided me with a lot of valuable information about the local fauna and flora. In addition, I used most part of summer holidays during the years 1994-1997 to the search of plants and animals, and to know better the main natural areas of Sax. As a result of this work, different papers centered on the flora, fauna and environmental problems of Sax were published in scientific (regional and national) and popular journals, with the aim to make this knowledge available to all the people interested on it. I have published a great part of these data in local popular journals (mainly in El Castillo de Sax), since I strongly believe that the conservation of the natural heritage of Sax only will be achieved when its habitants become concerned of its importance. This work also resulted in the publication of the first paper centered on Sax published in an international peer-reviewed journal (Environmental Management) and in two books centered on the environment and on the medicinal and poisonous flora of Sax.